This workbook is designed to support the AP® Biology Curriculum Framework. 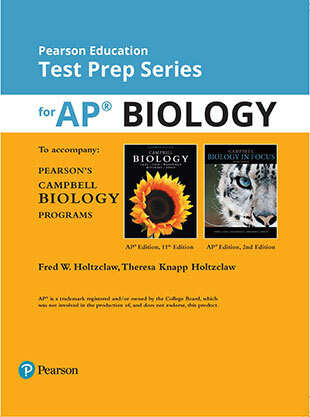 It is based on the comprehensive content of Campbell BIOLOGY 11th Edition AP® Edition and can accompany Campbell BIOLOGY IN FOCUS 2nd Edition AP® Edition. This Test Prep Workbook provides students information about the organization of the course by Big Ideas, and introduce them to the science practices. Content information is provided to summarize the concepts retained in the Curriculum Framework, while notes are added to separate content that is required from material teachers may use as illustrative examples. This workbook retains the student-friendly features— You Must Know boxes, Tips From the Readers boxes,and practice problems while also including an emphasis on making connections between topics and integration of science practices.